Consumer Financial Protection Bureau Director Kathy Kraninger speaks to media in Washington, D.C., in December 2018. The Consumer Financial Protection Bureau is targeting one of the hallmarks of the Obama administration: a rule that would protect the most vulnerable borrowers from the ballooning debt that can accrue with payday loans. The rule never actually took effect. And now the consumer protection bureau is proposing to take it off the table. 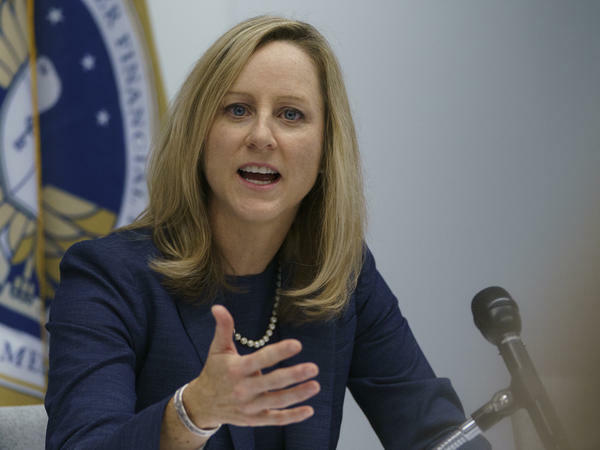 The agency's chief, Kathy Kraninger, said in a statement that pulling back the rule would encourage competition in the payday lending industry and help improve credit options for borrowers in need. Critics say the consumer protection bureau is siding with the very industry it is supposed to regulate and is scrapping a rule that would have protected borrowers from skyrocketing interest rates. The way payday loans work is that payday lenders typically offer small loans to borrowers who promise to pay the loans back by their next paycheck. Interest on the loans can have an annual percentage rate of 390 percent or more, according to a 2013 report by the CFPB. Another bureau report from the following year found that most payday loans — as many as 80 percent — are rolled over into another loan within two weeks. Borrowers often take out eight or more loans a year. A rule cracking down on payday loans was first proposed in 2016. President Obama touted the rule as the end of predatory lending. He warned payday lenders in a speech: "If you're making that profit by trapping hardworking Americans into a vicious cycle of debt, you've got to find a new business model." The rule would have required lenders to determine whether customers could pay off their loans. It would also limit payday lenders to only two attempts to withdraw money from borrowers' accounts, a move designed to target the fees that payday lenders charge. Under the Trump administration, the consumer protection bureau reversed course. The rule was supposed to kick in back in January 2018 — but it never did. Instead, then-CFPB Director Mick Mulvaney delayed the rule. On Wednesday, bureau officials said they plan to nix the part of the rule that requires payday lenders to check borrowers' ability to pay. And they plan to delay the rest of the rule until 2020. A senior CFPB official said the bureau's decision stems from a concern that there is not enough evidence showing that payday lending is unfair and abusive enough to necessitate the rule. Also, the official, who spoke to journalists on condition of anonymity, said that if the rule had kicked in, some two-thirds of borrowers wouldn't qualify for a payday loan. Consumer advocates say the move hurts borrowers. "The people in power have chosen to side with payday lenders over consumers," said Kyle Herrig, senior adviser to the consumer advocacy group Allied Progress. Herrig said the payday rule under discussion was written after five years of research that included examining millions of loan records. "That research concluded the ability-to-repay standard was critical to protecting consumers from falling into the debt trap," Herrig said. Advocacy groups said removing the protections will leave minority communities particularly at risk. "With little accountability for their actions, payday lenders have long preyed upon communities of color and drained them of their hard-earned savings," Hilary Shelton, NAACP Washington bureau director, said in a statement. "We strongly urge Kathy Kraninger to reconsider her decision to weaken the payday lending rule and allow it to move forward as planned without delay." Marisabel Torres, senior policy analyst at UnidosUS, said her advocacy group and "thousands of Latinos" joined a national campaign calling for a strong payday lending rule. The CFPB was created to protect consumers from losses like those suffered in the Great Recession. Its first director, Richard Cordray, took aggressive steps to regulate banks and other financial institutions. Republicans accused Cordray of wielding too much power. President Trump's first pick to head the agency, Mulvaney, had called it a "sick, sad joke" and as a congressman proposed a bill to abolish it. Mulvaney had accepted campaign donations from payday lenders, and NPR has reported that under his leadership, the agency loosened its oversight of the industry. Payday lenders including Select Management Resources, Advance America and Check Into Cash Inc. have also donated substantially to Trump's inaugural committee. The industry's trade group, the Community Financial Services Association of America, held its annual conference at Trump National Doral Golf Club near Miami in August 2018.